I spent a couple days last week "takin' it to the streets" in Chicago where I met with the most inspiring group of women, all affected – some quite tragically – by preeclampsia. As Nikki Mather, co-chair of the 500-participant-strong Chicago Promise Walk, said, "I get so frustrated reading online posts by women lamenting the problem of preeclampsia. But when you ask them what they're doing about it...nothing!" Looking around that group of fired-up ladies, I was energized by their effectiveness, their stories, and their commitment to tackling their experiences with action rather than hand-wringing. When you volunteer for a Promise Walk for Preeclampsia you will, by the very act of executing the event, raise awareness and educate people about this life-threatening disorder of pregnancy. That's even if you don't get the immediate gratification of a "you saved my life" story (which sometimes happens, too!). And you are raising money that goes directly into our research and education initiatives, accomplishments that are changing the course of preeclampsia. Every time I speak to physicians, nurses, midwives, and all care providers in the continuum of maternal health care, I carry you - the survivors, the families who have been affected - with me. Your stories, photos, quotes, and experiences – the good, the bad, the tragic, and the inspiring have helped us impact audiences from 15 to 5,000. And healthcare providers are taking notice. We spend time sensitizing them to the emotional impact of a life-threatening (or life-taking) pregnancy, as well as teaching them a few basics around health communications practices that can improve the patient–provider relationship. This has resulted in greater uptake of patient education materials and the creation of a patient and family support task force that will deliver its findings very soon. More recently I've been developing a model of preeclampsia that involves expanding the 'story' of the hospital event to include the prologue – all that comes before we presented to the hospital – and the epilogue, all that comes after, when they discharge us home and assume that our recovery will be short and uneventful. It rarely is. The next morning, I spoke for an hour to physicians at the University of Chicago's Lying In Hospital – a historic building and institution with an expectant future in the midst of South Chicago. The original architects left one of the cement "plaques" blank (see photo at right, with my hosts Drs Lindheimer and Rana), not memorializing famous contributors to obstetric research and practices as all the other plaques, but awaiting the name of the person who figures out how to prevent or cure preeclampsia. It was an honor to speak in such a hallowed place. 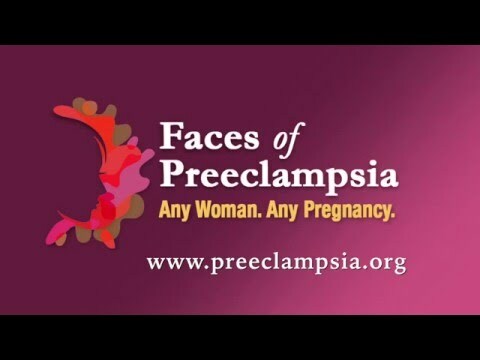 One doctor, Brian, approached me after and raised an important question: what happens when you, the Preeclampsia Foundation, do your job so well that physicians no longer ignore signs and symptoms and instead start over-correcting, delivering babies possibly sooner than necessary to prevent "mild" preeclampsia from turning bad quickly? The aversion to adverse outcomes is good, but some hospitals have gotten very proactive and deliberate about preeclampsia. They don't miss, ignore, or wait. Sometimes being trigger-happy – delivering sooner than necessary – isn't good either. I'm not sure what the right education message is to achieve the perfect balance, but I do know the investment that's desperately needed are biomarkers to accurately predict and clarify who needs to be delivered, and therapeutic interventions that will allow pregnancies to continue safely, giving babies as much as time as possible in a healthy womb. So what is the right balance? Would you rather have a hospital system that defers to bailing out of a preeclamptic pregnancy as soon as possible or one that takes more of a wait-and-watch approach? Does a "partnership" with your provider matter?